One late September evening when the family was all in their bedtime routines and the sky had been dark for a few hours, I sat down at my computer to close things up for the day, and when I looked up out the window I saw the most beautiful sight: the bright slip of the moon hanging just above the line of apartment buildings to the north of us, shimmering through the leaves on the treetops. I ran into the girls’ room to urge them to come see it in its half state, just peeking above the buildings, and they hurried to the balcony door to see the moon. “Look!” I said, “It’s about to set,” as the moon narrowed, as if about to dip under the roofline, out of sight—but no, wait, it was getting brighter again. That didn’t make sense. If the moon goes down, it goes down; it doesn’t come back up again. And rather more typical for the moon to rise than set, isn’t it? The kids shrugged their shoulders and wandered back down the hall in their pajamas, ready for books and bed. I lingered at the window watching the moon glow bright with intensity, then disappear, then return again. I chalked it up to the leaves shuddering in the wind, distorting my view, and turned and left the moon behind. The next night, the same thing, though this time I called no family member to witness it; I knew the moon shouldn’t appear in the same place night after night, yet here it seemingly was, bright as anything, the right size, the right incandescence, twinkling through the leaves and branches that obscured my view. I found it baffling. Night after night I’d stand at the balcony door and stare at that enticing glow, hands on my hips, wondering what it was that lit up the night sky. After a week I gave up, dignifying it with only an occasional glance. It was after we returned from our fall trip to Paris, when cool winds had swept in and pulled the last leaves from the trees in our absence, that I realized what I’d been admiring. 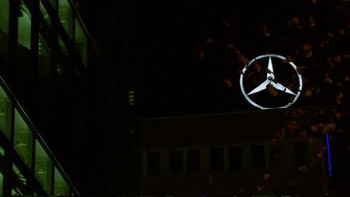 Not the moon at all, but the Mercedes logo glowing in the night atop its Kurfürstendamm headquarters, spinning and spinning in the dark night. With the leaves gone it was clear as anything that the glow that seemed as bright as the moon was mere fluorescent light molded into an almost-peace symbol, an emblem that belongs on the hood of a car, nothing more. Like so many things in Berlin, I’d mistaken one thing for another; mistook east for west, shopkeeper for confidante, corporate logo for moon. Acquaintances we met in the fall who I thought would become integral to our lives here were never seen again. The year felt disjointed; I felt naïve, unable to distinguish the real from mere artifice. In the fall I saw only the sorry excuses for the moon; it would be a while before I saw the magic in what I had once dismissed as trickery. Like, for instance, my role in this sabbatical year. Once I had accepted the phrase “trailing spouse,” offered by a friend also married to a professor who has moved his family across the country more than once, though it was too diminishing a term to embrace. It reminded me of a children’s book I read many times to my girls, which includes the line, “Twinkle twinkle little slug, leaving slime trails on the rug”—this is what came to mind when I pictured a “trailing spouse”; I knew I did not want this to be me. The Lindberghs: Charles as pilot; Anne as crew. Image courtesy of NY Times. Only lately have I found a better analogy for my role in this sabbatical, unearthed in a book lent to me by Melissa: North to the Orient, by Anne Morrow Lindbergh. Who could have been more of a trailing spouse than the wife of Charles Lindbergh, sitting behind her aviator husband; making every journey, yet never in the pilot’s seat? You can hear in her asides to herself and her readers the mental leaps she must make to see herself as a full-fledged partner in the expedition; she has let others define her and as their esteem rises, so does her own. And when I read the passage above I related to her as a peer, thanking her for giving me a way to ditch “trailing spouse” for a more dignified term: Co-pilot. Crew. I felt like a true co-pilot and treasured crew member at M’s recital this past weekend. 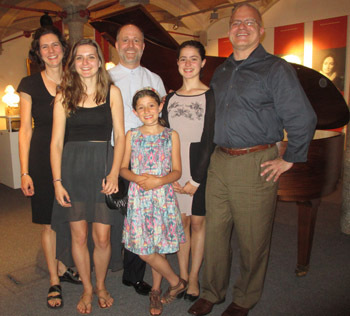 This whole spring, it seems, has been leading up to M’s recital at the Mendelssohn Remise. He has spent months preparing: practicing at Hanna’s, rehearsing with a fourhand partner in Charlottenburg, getting coached by a former student of Claudio Arrau in the eastern fringe of Berlin, plus many sessions on the grand piano at the Remise itself, playing for tourists who came to pay homage to the Mendelssohn family. All of this in preparation for the recital he played on Sunday. The recital was the culmination of M’s time here, certainly, but also a focal point to bring together the various strands of our networks in Berlin—M’s and my own, and Geoff’s—M’s brother who has had an invisible hand shaping our whole experience here. Recitals are like weddings; people arrive from different parts of your lives that you’d never expect to see in the same place, even though you knew they might all come to this event. You’re confronted with your different selves, the person you are at the boathouse, the person you are in a friend’s kitchen, the person you are at Bilderbuch Café, the person you are on the S-Bahn after a heart-wrenching movie. You are family, you are friend; you are rower, you are sister-in-law. You jump from one conversation to the next, one language to the next, still in the baby pool in the German conversations; earn an undeserved compliment, “Dien Deutsch ist wunderbar!,” after which you clam up so as not to make the woman eat her words. After M’s recital (he’s in the middle). Geoff is on the far right. And here is Geoff, M’s brother, on his fifth visit to Berlin during our stay, the most we’ve ever seen him in the 20 years I’ve known him. We’re living in his adopted city, the place his heart is, even if his job is in D.C. and his house is in New Hampshire. His friends have become our friends, notably Elke and Micha, who made the venue possible at the Mendelssohn house, and Birgit and Doris, our busy neighbors down the block who have not had much time for us this year, but the time they have given over to us has been enjoyed fully. M’s network is richer than I might have expected, more evident to me at the recital as he performed Schubert with Heidemarie beside him for a fourhand piece, and Hanna sat in the front row and glowed with pride after he dedicated the Beethoven to her, and his newfound piano coach Peter sat in the audience to take it all in, and Rheinhild greeted him jovially afterwards to congratulate him. A colleague from Macalester drank in the Beethoven, and a former student sat with our girls. M’s father, come all the way from Pennsylvania, sat beside me; an old college friend of M’s and her partner, flown in from D.C., sat in the next aisle. And friends from my circle, namely Melissa and Anne, smiled back at me from deeper in the audience. After the recital everyone gathered for a reception and then slowly dispersed, our family and a handful of the audience heading to a nearby brasserie for dinner. Geoff and I were trailing behind them, and we held hands as we walked, an endearing, natural gesture. And it struck me, as we strolled along, that this year was largely possible because of him—his network of friends had come through for us; they’ve let us into their lives. And I said as much, and thanked him, but with that dawning realization that you owe more than you can possibly repay, you’ve been given a gift of such magnitude—we’re here because of you! None of this would have happened without him, choosing Berlin, staying in Schöneberg, hosting a recital here, bringing together all these people in one place—Geoff’s connections were the underpinnings that framed it all. We’ve added our own connections to the mix, of course, but we simply wouldn’t have chosen Berlin had it not been for Geoff, and all else stemmed from that decision. From our first moments in Berlin, his friends have sheltered us from being overwhelmed; Geoff’s friend Elke having picked us up at the airport in a taxi when we arrived, showing us the way to our new apartment. Helped us with our suitcases, then took us two doors down our street to Birgit’s house, where we were served our first meal in Berlin. Then Geoff arrived a day later, and showed us around the city that first week, and how bereft we felt when he stood to leave, how tightly I hugged him, afraid to be left alone in this strange place. But he came back, often—Thanksgiving, Christmas, spring break, and for this June recital—following us through this year, making sure we were okay. “You have such wonderful friends,” I told him. And Geoff nodded as I said all this, still holding my hand, replying that his friends are like family to him, and he thinks in part it’s because they met before the wall came down—West Berliners cut off from their West German relatives, a trip through East Germany standing in the way. So they clung to one another, and Geoff became godfather to Elke’s daughter, more like an uncle, more like family. And his Berlin family had, over the course of this year, become our own. Geoff and I were bringing up the rear in this procession of family and friends from recital hall to restaurant, M leading the way, being the musician whose art had brought everyone together on this day, and in between us walked their father, and our girls, and Hanna, and Elke and Micha, and others dear to us, past the stately Gendarmenmarkt, the most beautiful square in the city that Geoff had unveiled to us in our first days here. And at that moment I felt like Anne Lindbergh, in the back seat of the plane, bringing up the rear of the family, having learned enough of the local Morse code to get by, having found my place in this family and sabbatical. I caught a glimpse of the year for what it was, not a denial of home after all, but a gift of altered space and time; not my husband’s sabbatical but ours, mine as much as his, a year to mold as my own. A Mercedes moon in its own right; what could have been a mere trailing spouse’s year abroad was instead a heavy moon, ripe with possibility, shimmering in the bright, hopeful sky. This entry was posted in Music - Opera and piano, Sabbatical and tagged Anne Morrow Lindbergh, Beethoven, Berlin, Bilderbuch Café, Charlottenburg, Claudia Arrau, Kurfürstendamm, Mendelssohn Remise, Mercedes, moon, North to the Orient on June 18, 2014 by Jill M.. This piece brings a tear to my eye! Wunderbar! what a beautiful wrap up of your time here in Berlin and your coming into your own! For me it was wonderful to have you both and the girls here. It enriched my life. Thank you, Hanna! You have enriched ours, without a doubt. Thanks, Kiki. You’re on your way to Berlin sometime soon yourself, isn’t that right? If so, I wish you well in your own adventures here. Aha you have excellent memory Jill. You’re on your way out and I’m right behind you.unfortunately my August arrival is pushed back to September, but I’m descending on Berlino come hell or high water. I will be blogging about it all so perhaps we can keep tabs on each other this way. Either way keep writing/ blogging. It is really bringing out your inner self and you tell your stories beautifully. Kiki, good luck with your planning and move. Let me know the link to your blog and I’ll gladly follow along. I sure will miss this place and I hope you enjoy it as much as I have.